Next up in our positional reviews: third base. This is essentially just about Justin Turner, who logged 777 innings at third last season. 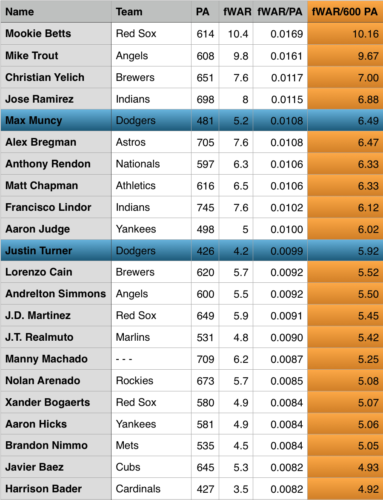 Kyle Farmer also contributed 135.2 innings, and while Manny Machado and Max Muncy also had significant innings at third, they received the bulk of their playing time at other positions. Last year the Dodgers totaled some of the top production from the third base position in the entire league. It would’ve been even higher if Turner were healthy to start 2018 because he’s really really really good. 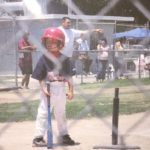 Turner was hit by a pitch towards the end of Spring Training which resulted in a broken left wrist. That sidelined him until halfway through May. He played just 103 games, but still put up 4.2 fWAR in 426 plate appearances. He had only 189 PA in the first half of the season where he looked like he was just a little rusty, which makes sense considering he missed two months with a broken wrist. Still, he struggled to a 110 wRC+, which is always nice. His second half was another story. Turner caught fire, slashing .356/.447/.619 for a 1.066 OPS and a 190 wRC+. Among batters with at least 150 PA in the second half, Turner’s 190 wRC+ trailed only Christian Yelich (220), and Mike Trout (205). Not bad. This is just another reason to push the pieces into improving the team regardless of cost right now. In any given year, Turner is almost a lock to be a Top 15 batter in the league. Among 214 batters with at least 400 PA last season, Turner was 7th in wRC+. He’s one of the best hitters in the league and the Dodgers should capitalize on that. Bryce Harper is still a free agent, I’m just saying. If WAR is your preference, here you go. Turner was 33rd in fWAR last season. It factors in fielding as well as base running. Turner is a solid defensive player, but he’s no Nolan Arenado or Matt Chapman. He’s also decent on the bases, but his relatively average speed limits him from being a threat. To get a better idea of where Turner would’ve been if given a full season, it makes more sense to average out fWAR over 600 plate appearances. Turner’s performance last season would’ve been roughly 6.0 fWAR if healthy, which would’ve put him at 11th in the league. 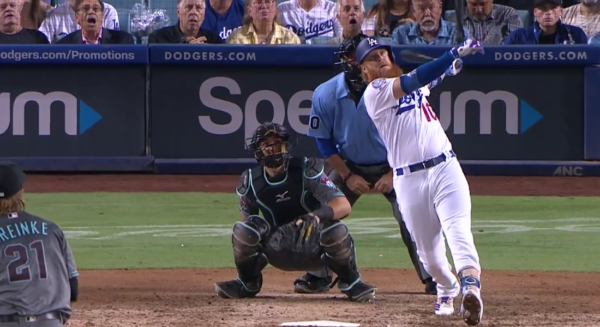 Essentially, Justin Turner was elite last year and is a bonafide star. This is nothing new, he’s fantastic. Farmer had 389 plate appearances in 2018, however only 77 of those were in the MLB. He didn’t do much with those appearances, but he was pretty average which is basically what you expect from him. He was the third piece in the trade that sent Alex Wood and Yasiel Puig to the Reds. Hopefully it’s a good fit for him and he can get more regular playing time. There were a handful of other Dodgers to log time at third, but they’d all been written about at a different position they played more often. Manny Machado contributed 143 innings, Max Muncy 271.2 and Logan Forsythe 96.2. Machado was written about at short, Muncy at first, and Forysthe at second.